← Welcome to Kandy’s Keepsakes! Most of my Memorial weekend was spent gardening. With the help of my kids, Bert (9 years) and Anne (4 years), we put in 2 flower beds and our vegetable garden. It was long hours, but enjoyable hours. Watching my children I couldn’t help seeing myself as a little kid learning about flowers, vegetables and marveling how a big carrot came out of a little seed. But when all that manual work was done it was nice to sit down, relax and rubber stamp. After seeing all thoses flowers and plants I was inspired to make a “spring-y” card. So I started going through my drawers and drawers of cardstocks and papers from The Angel Company. (All right, I admit I’m a paper junky!) When I came across the Mia’s Cottage Collection I just had to use it. It was all the colors I had just been up close and personal with for the last few days… the clear blue sky, the green of new grass, the organges and pinks from all the flowers. Next, I sat down in my stamp closet (yes, I have a closet full 🙂 ) and proceeded to go through them all to find just the right set. I pulled out several really nice flower sets, but they just weren’t “right”. They didn’t complete my “Spring is in the Air” feeling. I came across “Retro Butterflies” and I knew immediately I had to use this whimsical butterfly. Then I found “changing seasons” from the set “It’s the Little Things” and it totally completed the picture. Not only did I have the clear blue sky, the green grass, pink and orange flowers I now had the fluttering butterflies and the perfect greeting. After I stamped, colored and assembled the card I still thought it needed a little more. So I got out my crystal Stickels and added some shimmer to random areas of the flowered cardstock and the stamped butterfly. It reminded me of my flowers after I had watered them with all the “sparkley” water drops collected on the petals and leaves. I have to say I really loved the way this card turned out. I’m going to send it to my grandmother. She’s the one who taught me all that I know about gardening. She passed her green thumb to me and I want to pass it to my little ones. I think she’ll love it! 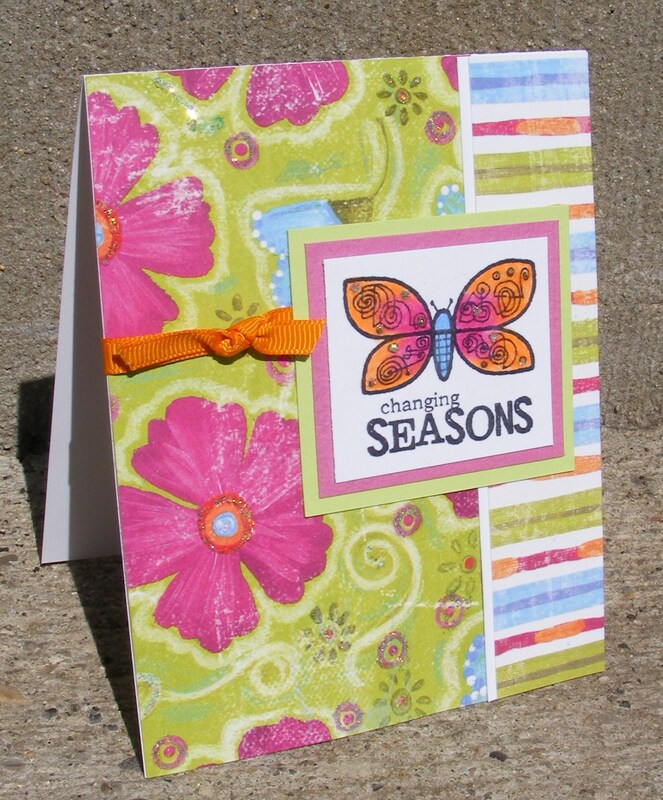 This entry was posted in Cards and tagged art, butterfly, Crafts, gardening, greeting card, rubber stamping. Bookmark the permalink.